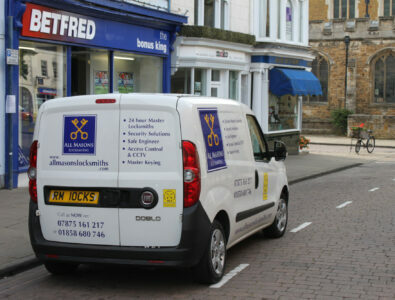 Here at All Masons Locksmiths we are the leading commercial locksmiths, holding over 15 years of experience within the industry. All of our staff are CRB checked, have the latest training and product knowledge, alongside full public liability insurance of up to 5 million pounds. We offer a free security site check and can quote you over the phone, resulting in no hidden charges. Our fully stocked vans have all of the equipment necessary to complete any job on the spot, so whether you are locked out of your home, or you cannot access your safe, give us a call and we will be happy to assist. At All Masons Locksmiths, we try to offer a comprehensive service to ensure that our customers can always call on us when they’re in need of our help. Available for both emergency and commercial work, as well as lock and uPVC repairs, we’re skilled, experienced, and expert at what we do. Based in Market Harborough, we are dedicated to offering our assistance around the clock, and are available for callouts 24/7, meaning that should you ever find yourself shut out of your property or in need of repair work following a break-in, we can be with you within just an hour of hearing from you. Equally, we can arrange a visit by appointment, meaning that any time you need a site security check, one of our fully CRB-checked staff can be sent out. Typically able to complete any necessary jobs on the spot, we are able to repair or replace around 90 percent of locks on-site so that you’re never left vulnerable. Fixing locks and uPVC products is another of our fortes, and our master locksmiths can be contacted at any time to assist individuals and companies throughout Northamptonshire, Leicestershire, and the surrounding areas. Friendly, fast acting, and flexible, our team offer an unparalleled commercial and emergency locksmith service, and will always do their best to keep your home or business safe and secure on your behalf. Why not visit our testimonials page now to see the many customer recommendations we’ve received, or else give us a call and speak to us in person to see how we could be of assistance to you? We are lock repairs specialists, and can repair 90% of locks onsite for windows and doors.